Caring for a pet guinea pig (Cavia porcellus) calls for always keeping a watchful eye on the little guy. If something is wrong with your cavy, you have to be on hand to pick up on it -- and then to promptly get him the veterinary help he needs. Head tilting behaviors in guinea pigs generally signify a medical matter that originated in the ears. If your guinea pig seems to have a problem keeping his head straight to the front, then he might have a case of head tilt. The issue might be conspicuous beyond his simply keeping his head sideways. In extreme cases, the lack of balance causes guinea pigs to collapse to the ground. They sometimes even spin their bodies, but only in the direction of their tilting. Other common names for the problem are both torticollis and wry neck. Wry neck is a reference to guinea pigs pointing their necks into single specific directions. Ear infections due to bacteria are frequently the culprits behind head tilting in guinea pigs. Your cavy's holding his head sideways could be a result of the frustrating infection traveling to both the inner and middle portions of his ear. Unsteady walking is an extremely commonly indication of wry neck in guinea pigs. 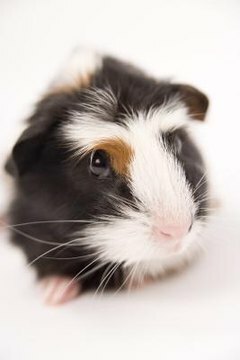 As soon as you notice your guinea pig's head tilting, whether it's to the right or the left, pay attention to his gait. Some guinea pigs with wry neck also experience nausea. Once you detect signs of possible wry neck in your guinea pig, waste no time in getting him the veterinary assistance that he deserves. If you wait around, you could risk permanent harm to your pet's hearing. Timely veterinary attention is optimal. With proper veterinary management, guinea pigs can often recover well from wry neck. If the case was particularly severe, however, his head might stay in a permanent sideways spot. Apart from that, they often act just as they did before. If you think of wry neck and head tilt as being health issues found exclusively in rabbits, that simply isn't true. While the problem is especially widespread in the rabbit world, it can undoubtedly appear in guinea pigs, as well. Wry neck is just a lot more infrequent in cavies. Symptoms of wry neck in rabbits are similar to those of guinea pigs. Exotic Pet Behavior; Teresa Bradley Bays et al. Harkness and Wagner's Biology and Medicine of Rabbits and Rodents; John E. Harkness et al. Why Can't Bunnies Get Wet?